The evening started by eating a questionable burrito salad. Everything seemed normal. Dinner was tasty and hit the spot. About 20 minutes later my stomach started rumbling and I just dismissed it as a bit of indigestion. As the night went on my stomach started to feel worse so I just called it early and went off to bed. That night I seem to go in and out of sleep where was never fully “out.” I woke up about every two hours would move around a bit and then fall asleep again. I was never fully awake but disturbed enough to remember the experience. It was just all blurry throughout the night. When morning came, I was still in pain. I was not outside of the window of a 24 hour flu, bug, or some other random malady. That being said, I still didn’t know exactly what it was as stomach issues can be a number of things: food poisoning, gas, constipation, appendicitis, hernia, pulled muscle, and so on. It all depends how the pain develops, where it is, and how intense the pain is. Sharp shooting pain is obviously the worst, but I didn’t have that type of pain. It was mainly a dull ache. All I can say here is YUCK! I checked in with my GP just to make sure everything was okay. I’m fortunate that I really like my GP. We’ve known each other a number of years and he remembers (or appears to remember) most of my history. My vitals were clear which was great. Everything with the stethoscope checked out as well. He pressed various areas of my stomach. Pain was localized in the right lower quarter of my stomach. He didn’t seem all that alarmed, but couldn’t rule out appendicitis so he wanted me to get checked further. I got promoted to the next doctor in line who referred me to a CT scan. I never had one before so I didn’t know exactly what to expect. The first part was drinking four large cups of die so my insides would render on the slide. The diet tasted like orange juice and mayonnaise mixed together. For those that know me, I have a deep distaste for mayonnaise. Those 4 cups had to be consumed in 15 minute intervals and it took 15 minutes to consume each cup. With each swallow the requisite gag ensued. The second round of the CT scan required intravenous die that would mark the rest of my body for the imaging equipment. The tech warned me I’d feel all weird as the dye went through. That was an understatement! Every part of my body felt flush in my already unsettled stomach muscles convulsed as the dye went through. With that behind me then it was the big wait. The CT scan would confirm or rule out appendicitis – a condition I knew very little about. After about 30 minutes, the doctor came in and said it was clearly appendicitis. I had a dumbfounded look as they didn’t exactly know what that meant. The doctor made it clear: I had to go to the ER. Surgery is something I always consider that was scheduled. I didn’t think a burrito salad would mean a trip requiring going under the knife. Some friends of mine met me at the hospital which was great. The whole experience was disorienting and it was reassuring to have close friends by as the reality of the future was setting in. I needed to have eight hours between my last meal and the operation. That meant I wasn’t going under the knife until midnight. In a lot of ways those few hours was the calm before the storm. Sure, I was in a hospital bed. I knew that surgery was coming, but the conversation was a welcome distraction from what was going on. I’ve not really had many friends go through surgeries in my community. The last one I distinctly remember was a few years ago. A good friend of mine had an accident up in Sacramento. Anel and I knew the right thing was to go see him and his family. Being on the other side of it, I’m grateful for the time that was spent with me. Camaraderie was a valuable thing. Meditating on what was going to happen for the surgery for five hours would not have been good for me. I headed down to surgery about 11:30pm Saturday night. As soon as I was wheeled out the room the reality of my surgery set in. Although I had people all around me leading up to the surgery I felt intensely alone in the hallway. All this was real. I was actually going to be put to sleep, cut open, and put back together. I know this is one of the most common surgeries done, but still you think you’re going to be that one statistic. Going into the operating room looked exactly like it did in the movies. They wheeled me through two double doors and the bright operating room lit up the dark hallway. I could see a narrow, green table in the center of immense machinery. I really wasn’t ready for this. I didn’t have time to think about it, prepare for it, and now the reality was all too around me. I glanced over at a cabinet seeing a bunch of cutting devices: scalpels, scissors, and things I didn’t know and was hoping wouldn’t be involved in the process. Honestly, at this point I was scared. My mind wandered to the rational and irrational. What if I didn’t wake up? Did I do right by Jesus? What if I do wake up when I’m not supposed to? I was physically shaking from all that was going on around me. It was an intense moment with a lot of emotion. Although it was a minor surgery, it’s still surgery. In broken English, the nurse mentioned, “you’ll be fine.” Three, two, one – and then I was out. I woke up not feeling the passage of time. I was definitely groggy and disoriented. Fortunately, that’s totally expected. Pete and Jake stayed up well into the night as the surgery was going on. Not having family around, friends truly become critical in moments like these. They are family. Family that I’m blessed to have. The surgeon seemed very laissez faire about the whole operation. He figured I’d be fine and that everything would return to normal in a couple of days. Being the skeptic that I am, I wasn’t willing to accept that reality until I got there. I was going to be sore in the stomach which was expected. I was also told that my right shoulder would be sore as well. That surprised me. During surgery, they fill you up with gas so that the surgeon has room to work. That gas travels along your diaphragm and up to your right shoulder as it exits your body. The gas puts tension in the shoulder which causes pain. Recovery was actually fairly simple. All I really had to do was sit in bed. 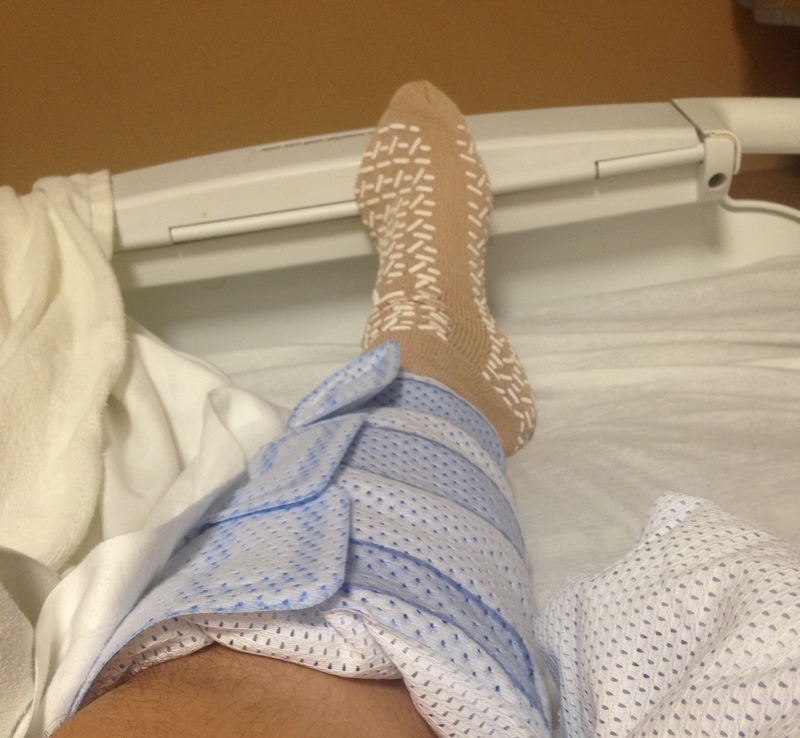 My legs had compression devices on them to keep blood moving. I was supposed to walk four times a day to keep my body limber. At first, getting out of bed was really tough. As the days went by, however, it got significantly easier. First I had to walk around the square in the hospital. In a couple of days, I was walking around the block in the neighborhood! All in all.. not bad! WOAH…… I had no idea all this went on. We need to catch up soon. I hope you are better now.